While the 701 and 711 imported double wire end tools are primarily used by ceramists and potters to trim and foot pottery, these sculpting tools work well in clay, Plastilina and wax for Encaustics. 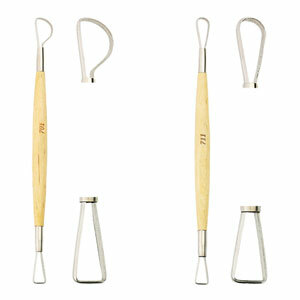 Both tools have lacquered handles, brass ferrules, and stainless steel cutting edges. The stainless steel allows for longer lasting wear as well as better cutting proficiency. Made with waterproof glue. The length of each tool is approximately 7 1/2".